Prince Edward-Lennox and Addington Social Services (PELASS) is striking while the iron is hot. With homelessness and the need for affordable housing hot button topics in both the counties it serves, the agency found a good time to consult on its plans in policy area for the next five years. 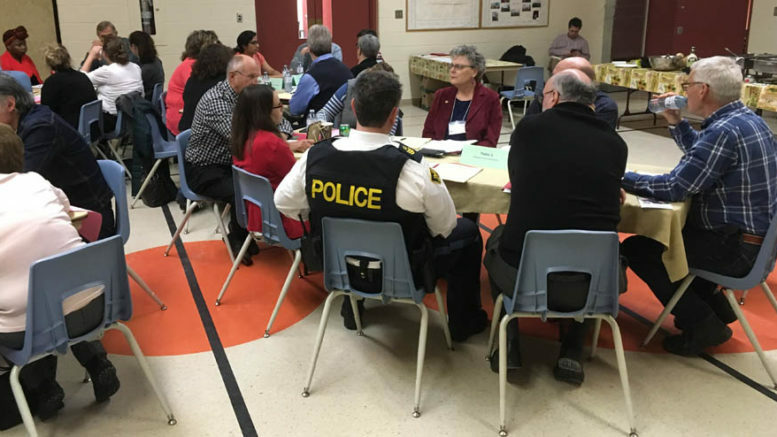 On Monday at Picton’s Salvation Army citadel, the agency conducted the second of two visioning days on the subject. The first was held in Lennox and Addington County last November. Stakeholders gathered to review PELASS’s existing 10-year plans and give feedback on strategic topics like eviction prevention, tenant relations, supporting seniors, mitigating problems caused by homelessness and addiction, and improving community information sharing. PELASS housing manager Annette Keogh said the agency completed a long-term plan in 2014, then received a provincial mandate to update it. Following the sessions, Keogh said a plan will be drafted for review by both councils and the province and then implemented. That will mean more consultation with agencies that work on the front lines of the social impact of precarious housing. Greater Napanee Mayor Marg Isbester, a former PELASS committee chair, was among those attending the session. She said with an aging population in the region, there’s a great need for affordable, accessible housing, making decisions over the next five years extremely important. She also said the issue of homelessness and its ties to mental health, health-care, and other community services is often at front-of-mind. “Things change and we need to have a plan to go forward. We’re trying to find a direction that’s going to work these next five years.” Isbester said that planning is particularly tough for municipal officials this year because the new provincial government is trying to find its footing, which creates some uncertainty, at the same time the federal government is preparing for an election this fall. The outcome could have an impact on National Housing Strategy funding that municipalities are awaiting. That said, she found the sessions useful for councillors from both counties and PELASS staff to gather information to shape plans for the foreseeable future. Her Prince Edward County counterpart Steve Ferguson and councillors Kate MacNaughton, Bill McMahon, Ernie Margetson, Janice Maynard, and Mike Harper were among those in attendance. Prince Edward OPP detachment commander Staff Sgt. John Hatch was among those gathered. He really enjoyed the collaboration with various social service and economic development agencies.